Ralf Heynen is a contemporary still life and portrait painter from the Netherlands. 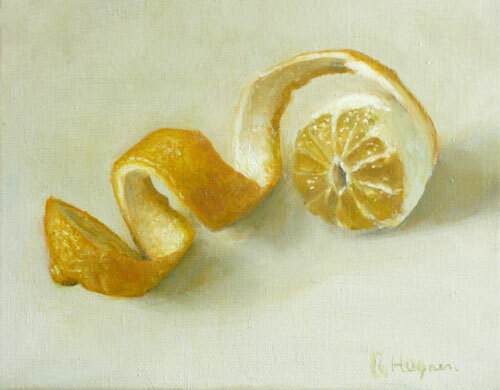 The incredible twists of the lemon peel bring a particular energy to this painting. Although it appears to be simple, the lemon peel is hanging on to the pulp of the lemon itself for dear life, just by a string. Meanwhile, the lemon is staid, still, unflinching in its almost perfect roundness. It looks heavy and sure of itself as compared to the peel, which is thick and rough and “struggling” to wrench itself from the body of the fruit or “mother”. Click here to see more of Ralf’s work.